Day One dawned bright, clear and pretty much windless. After waiting out the big (way too much) breeze on Saturday, and having a perfect 14-19 for practice on Sunday, it was a bit anticlimactic to say the least. Race committee was refreshingly down to earth, and without having to resort to flags or blue blazers was able to tell us exactly what they were thinking; making the smart decision to hold until the light northerly fell apart and turned into the east-southeast with building pressure that we were supposed to have. Race committees everywhere take note: its okay to let everyone know whatâ€™s going on and where everything isâ€¦ itâ€™s not an easter egg hunt. Canadian Around Alone sailor Derek Hatfield, will be in the greater Detroit area during the last week of January to speak at various venues. Derek competed in the 2002-2003 Around Alone Race, and despite a pitch pole and dismasting off of Cape Horn, managed to complete the grueling race and finish in third place. Derek is presently building an Open 60 in Cobourg, Ontario for this year's Five Ocean's Race, set to kick off from Spain in October. This is a presentation you will not want to miss. The presentations on January 25 (Windsor Yacht Club - 7:00 PM), January 26 (North Star Sail Club - 7:00 PM), and January 27 (Ford Yacht Club - 7:00 PM) are all open to the general public, and there is no charge. The presentation at North Star Sail Club is sponsored by the Great Lakes Singlehanded Society, as well as North Star, and there will be appetizers and a cash bar. See the flyer for details or contact Tony Driza tdriza@wmis.net for additional information! This past weekend a Madison iceboater Grant Frautschi of the 4LIYC won the 2006 Nite National Championship up on Lake Winnebago. In a strong fleet of 30 plus boats he was able to amass a significant 8 point lead and win the National Championship. On Sunday Grant showed us that he knew how to make his boat go when the wind piped up too. Sundayâ€™s races began at 9 a.m. in a moderate, 12 mph breeze, which by 10 had filled in to a steady 18 then built to 23 by the time the final race of the dayâ€™s 5 race series was completed around 1:30 p.m. No accidents were reported or observed in the 33-boat fleet during the 2-day, 6 race series skillfully managed by PRO Andy Gratton of the Oshkosh Ice Yacht Club. 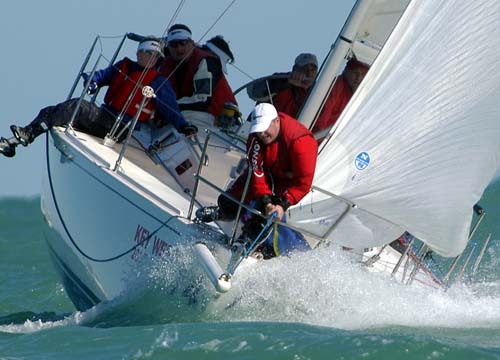 Destination One Design is the Website to go to for up to date information on Acura Key West Race Week. At 1448GMT Pirates of the Caribbean passed the Eclipse Island scoring gate to take fourth and the two points on offer, then promptly issued a press release announcing further damage and that they would be going to Albany, the closest port, for assessment and repair. We'd define value as bringing the boater just what he wants for the price he wants to pay. The all-new 2006 Lowe Stinger 175 does that. The Boblo boat Columbia needs some help from its friends. In the past two years, the Detroit Riverfront Conservancy has twice paid to have the 216-foot-long, 60-foot-wide vessel covered with plastic at a combined cost of roughly $70,000. The sun glinted off the icy surface of Lake Isabella Satur-day, but no one was on it. There were no snowmobile tracks. There were no foot tracks. There were no ice-fishing shanties. There were no ice anglers. Last week was the warmest week in mid-Michigan since mid-November. For lovers of winter sports, the weather that was more like early spring or late fall, well, just stank. For the first time in more than 40 years, locally caught Lake Superior lake trout could be available in supermarkets and restaurants next summer, if a proposal by the Department of Natural Resources gets the nod. CLEVELAND - Oglebay Norton Co., whose ships have sailed the Great Lakes for 80 years, is changing course in a big way and hopes to sell its fleet of 11 freighters. Somewhere down in the cold southern ocean, Pirates of the Caribbean skipper Paul Cayard is dreaming of Key West. Out on the lonely Haurakai Gulf, Team New Zealand skipper Terry Hutchinson is thinking about his favorite winter hotspot. Cayard and Hutchinson are regular competitors in Key West. Neither could make it this year due to Volvo Ocean Race and America's Cup commitments.